Of all the literary forms, the novel is arguably the most discussed . . . and fretted over. From Miguel de Cervantes's Don Quixote to the works of Jane Austen, F. Scott Fitzgerald, Ernest Hemingway, and today's masters, the novel has grown with and adapted to changing societies and technologies, mixing tradition and innovation in every age throughout history. Thomas C. Foster—the sage and scholar who ingeniously led readers through the fascinating symbolic codes of great literature in his first book, How to Read Literature Like a Professor—now examines the grammar of the popular novel. Exploring how authors' choices about structure—point of view, narrative voice, first page, chapter construction, character emblems, and narrative (dis)continuity—create meaning and a special literary language, How to Read Novels Like a Professor shares the keys to this language with readers who want to get more insight, more understanding, and more pleasure from their reading. I enjoyed this so much that I bought a copy. Enjoyable. 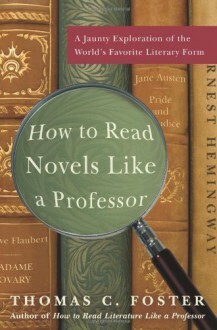 Towards the end, it seems like it should be titled, "How to WRITE Novels Like a Professor" and it seems to lose its way. This title is not nearly as good as the first one, How to Read Literature Like a Professor, but it's still a worthwhile read.